I didn’t watch Jurassic Park until I was in my mid twenties because I was too afraid of those creepy little raptor dinosaurs that scurry around and eat people. That fact has almost nothing to do with this DIY, but I just thought you should know. 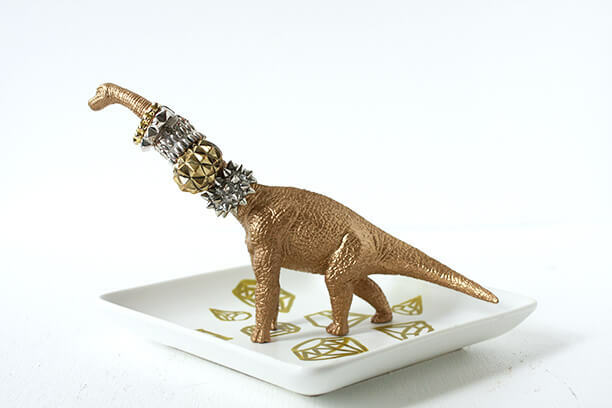 I bought a plastic toy brachiosaurus that was small enough to fit on a plain salad plate and spray painted him a nice shiny gold. 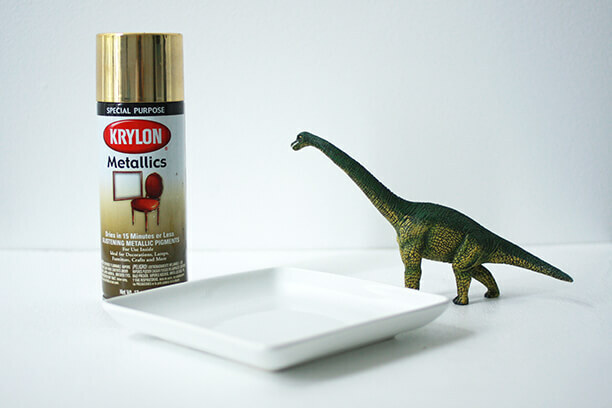 In order to protect my rings from the spray paint, I gave my dino a finishing spray of a clear gloss sealer once the gold paint dried. 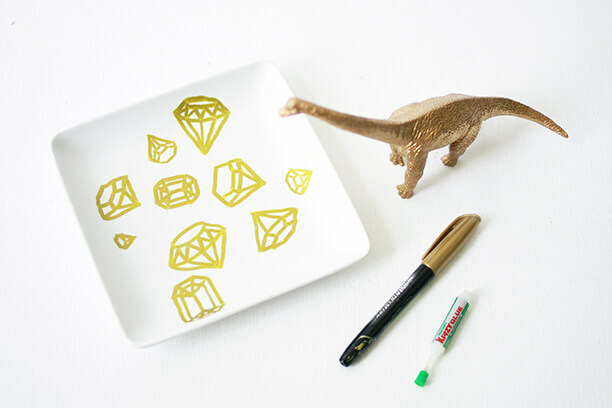 In keeping with the jewelry theme, I used a gold paint pen to draw some gemstones on the salad plate and sealed the plate with a layer of clear gloss. 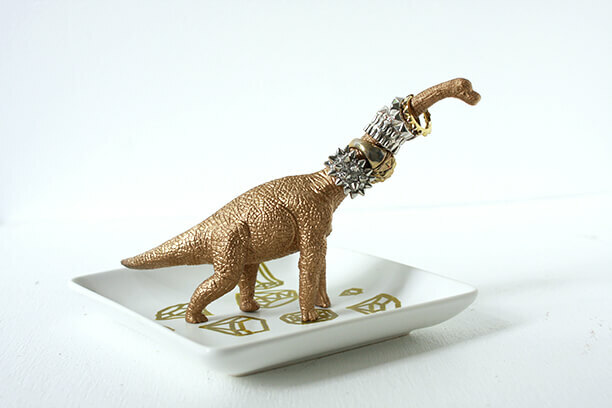 Once that was dry, I put a few dabs of Krazy Glue on my dinosaur’s feet, and glued him onto the plate. Ok, ok, sorry for the dinosaur humor (she said without meaning it). I love this little guy. He makes me happy every time I see him on my jewelry shelf. DINOSAURS RULE, EXTINCTION DROOLS! Categories: HCYMT? | Tags: dinosaur ring holder | September 11, 2013 by thebandwifeblog. Absolutely love love love this! Love this! You have some serious jewel-drawing skillz! Side note: my brother (born in 84) used to carry around a little foot by the neck of it everywhere! I mean everywhere, the store, the car, our grandmothers. You name it little foot was probably there! haha. I have seen a lot done with gold painted miniature animals, but this is really original and clever. Super cute! What type of spray gloss do you use? You always have fun DIYs! My goal for Fall is to do a fun DIY on my blog as I have never done one before. This is seriously the cutest and most clever DIY I’ve seen. It’s pure genius!! This turned out all kinds of awesome! I love how your turned stuffed that would be sitting around the house into something seriously cool. DINO MITE. I’m cracking up. You could have just called it a long neck and we all would have known what you meant. This is too cute. I want to make one. Love this! 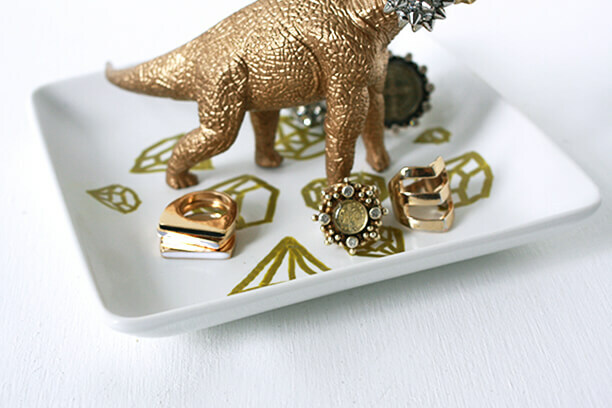 The gold makes that dude look seriously glamorous and I love the diamonds you’ve drawn on the tray. I recently turned a plastic giraffe indigo blue to hold my hair elastics- they have never looked so fancy! Such a fine way to use or recycle kids toys! Especially when it results in things for grown-ups! I really enjoy your DIY’s! I love this!! 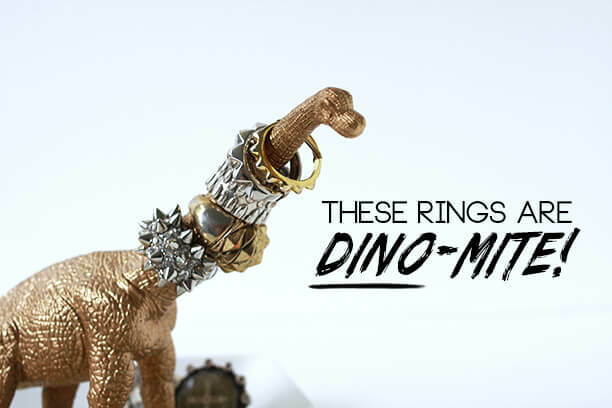 I bought my dino…and rhino, and a bear and my spray paint!! Can’t wait to see how they turn out! Thanks for the suggestion! I love this!! I have a silver lion my friend spray painted for me sitting on a pretty dish on my bedside table. If only it could hold rings! I am trying to make a few of these for my lady friends. Quick question or three for you., how long did you wait to do a second coat and since I am doing them in the cold of my garage do you think that will make a difference? Wait did you do to compensate for covering all those tiny Dino butts and chins? Wait till they are dry then flip them around for a few more coats? Coming back at ya with another question. I am using Krylon spray paint (in gloss for one set and matte for another) and have moved these bad boys into the basement. Have just done another spray coating but am noticing a bit of the green of the dinosaur’s original color is still visible. Did before mentioned coat about 30 min. ago. How long did you wait between coatings and should I have gone with a different type of Krylon (Metallic like you did) SP or do you think these will work out no matter what? Hi Laura! This is so fun and hilarious- and cool at the same time. LOVE the gold and white. I included this project in my 15 DIY Jewelry Organizers and Displays. http://www.missloviecreations.blogspot.com/2014/01/15-diy-jewelry-organizers-and-displays.html I hope you’ll come check it out and grab a button if you like. Have a great rest of your weekend!